With the luxury of a double and sofa bed with bed linen provided, your own ensuite toilet/shower, and microwave and fridge, our camping pods are ideal for couples and families. Each pod sleeps up to 4 and has your own private parking space nearby. 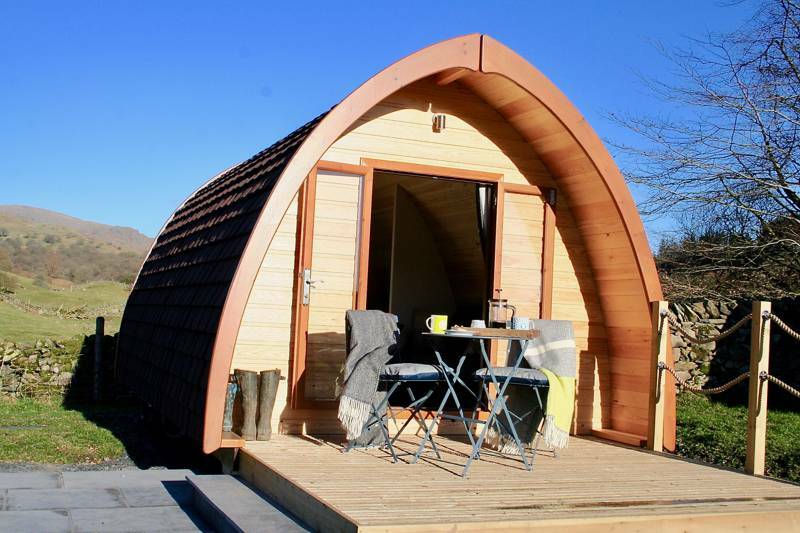 Our luxury pods are sited in their own large field on our family farm, with spectacular views of the Kentmere Valley and surrounding Lakeland fells. Enjoy the wide open space around the pods and beyond. It’s the perfect place to relax, for children to play and enjoy a truly off-grid experience – with no Wi-Fi to disturb your peace. You can completely switch off and forget about the outside world. Eating outdoors under the stars is really special. Each pod has its own barbecue and outdoor furniture, so relax with your favourite tipple and cook up a feast. Indulge in locally sourced fresh treats from Staveley. With no light pollution, on a clear night, the sky here sparkles with stars.